Geological Characteristics and Occurrence Regularity of Ag in Shidonggou Ag-Pb-Zn Polymetallic Deposit,Subei County Xu Jinxiang;Zhao Litao;Wen Peng;Wang Jianglong;Liu Hongwei;Zhang Jie;North China Engineering Investigation Institute Co. Influencing Factors of Visibility of Grouting Concretion Body in Grouting Curtain Body in A Iron Mine Wang Xin;North China Engineering Investigation Institute Co.
Collector NH-03 Floating Secondary Copper Sulfide Ore Experiment Cao Haiying;Li Lin;Li Yongfeng;Jiangxi Ionic Rare Earth Engineering Research Co.
Research and Application of Large-scale Recovery Magnetite Technology and Equipment from Surrounding Rocks of Iron Mine Shang Hongliang;Shi Peiwei;Beijing General Research Institute of Mining and Metallurgy;BGRIMM Machinery & Automation Technology Co.
Development Utilization and Research on Siderite Resources of Jielong Iron Mine Hua Gaobo;Chongqing Steel Group Mining Co.
Copper Sulfur Separation Test of Sulfur Concentrate from Luohe Mining Company Wu Xinyi;Anhui Masteel Luohe Mining Co. 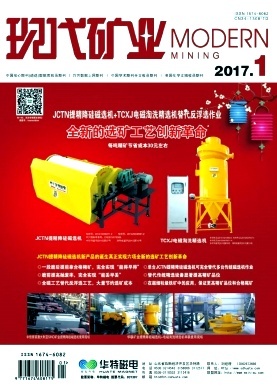 Influence of Molybdenum Rough Flotation Agent System on Flotation Index Wang Yongchao;Jinduicheng Molybdenum Co. Prediction Model of Rock-burst Based on Information Fusion Theory Lu Yongfei;Zhang Lingjie;Li Ning;Ouyang Jian;China Nuclear Power Engineering Co.